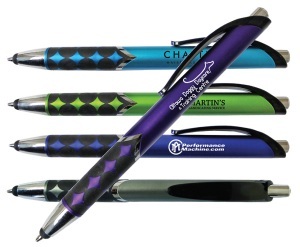 This click pen has stylus tip with chrome accents. Pen tip extends through stylus tip. Rubber circle pattern on grip. 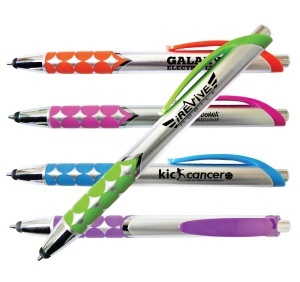 Stylus pen colors are lime green, orange, pink or purple. Medium point ink cartridge available with black ink only. 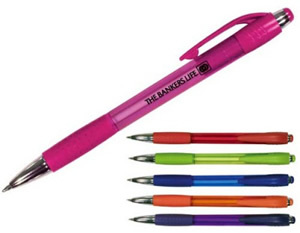 This colored barrel pen has rubber circle pattern on grip. Pen tip extends through stylus tip. Click pen has chrome accents. 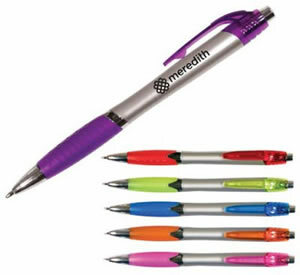 Stylus pen colors are purple, light blue or gun metal. Medium point ink cartridge available with black ink only. Barrels change color with the heat of your hand. Color changes best ot room temperature. Stylus tip on top of plunger. Narrow stylus for more control. Mood colors: green to yellow, orange to yellow, blue to white, purple to pink, tropical red to orange. Imprint area: 1-1/8" wide x 3/16" high. Medium point ink cartridge is available in black only. 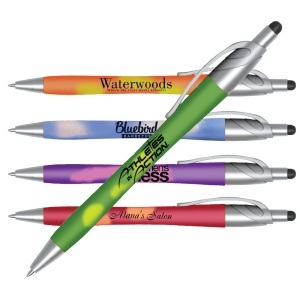 Bright white barrels with plastic mood grip that changes color with the heat of your hand. Color changes best ot room temperature. Chrome trim. 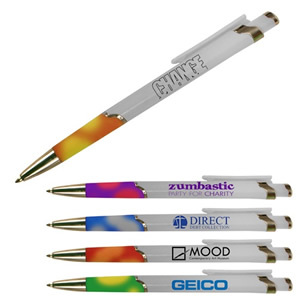 Mood grip colors: purple to pink, blue to white, red to orange, green to yellow, orange to yellow. Imprint area: 1-3/4" wide x 5/8" high. Medium point ink cartridge is available in black only.